Mark Chapman presents the best of the latest action from the NFL, with expert analysis from Osi Umenyiora and Jason Bell, and previews the upcoming games. Browse content similar to Atlanta Special. Check below for episodes and series from the same categories and more! two teams to settle it. Launched the ball the near side. He's looking downfield, going deep. and the New Orleans Saints. that's a sign of friendship. the rivalry stretches back 50 years. of the encounters of the season. It's a defining moment for us. of the great Super Bowls. comeback in Super Bowl history. Romance that must be cast aside. You can smell the newness and here. So pre-match, what is the lighting? in them for all their devices. when the players come in. time I've been up here. He's just nicked a towel. It was all Osi's fault. Then you put a little white down it. You've got to have these, man. as you want during the game. you in Times Square because of that. you will find is the training room. and we have the cold tub. can get one for you. works at on game day. will be full of fans. outside, as the team is walking out. They put a man on the moon, Jason. inside and get more selfie spots. That is serious, that is cool. When you hear about wide receivers. this is the guy who started it all. Did you just say starness? That's adding things to everyone. I say bigness today in meetings. is what you call brotherology. There's a bigness in brotherology. So, how bigness is this game? This is a huge game, not a big game. they've got to win tonight. receiver, much like Jones is. it's a gift from God. The quarterback, a gift from God. That's the baddest man in the world. Julio Jones, gift from God. he knows how to run routes. crazy, like most of us. He could really be crazy. Would you say you are crazy? want to give me the ball. the season as a whole. who would it be between? in the Super maybe this year. You just made his whole year. He's off the chain dog. The Rams were running hot. down, we set them down. and now you've got Case Keenum. He'll beat the New England Patriots. Got to be off the chain. we love having you want. just let me get this accent. I'll be off the chain. They are the best looking dudes. and took them across the pond. How much has he impressed you? I'm impressed by this guy. and what he's been able to do. as good of a receiver as he was. is going to be tonight? in who wins this game? That's who they were last year. This is heaven for you! or defensive line stopping the run. I'd go Pittsburgh and Philadelphia. Things have been going their way. like that since these guys. I just like what they've built. It's a tough place to play, man. That crowd, they are unbelievable. Always nice working with you guys. Jack Crawford has joined us. What kind of team have you joined? the league right now in my opinion. arms, so it feels like a family. us that talent is just God-given. He's had it given from God. What are they both like? but every day they prove that. working people on the team. he's from a different planet. in practice and on game day. You've got a good life here. You couldn't ask for any more. just makes our job even better. and we'll see you soon. on the three, 2nd & 3. He gets a four-man rush. There he is in open space. Setting up that for Kamara. third and long for New Orleans. They are shaken up on that one. Play 15 of this drive. with a nice block here. Watch Toilolo out here at tight end. up on that next level. and the heel doesn't come down. There is no flag over there. There was a lot of contact. and what a swing here. Flag down on the far side. 61 was not in line with scrimmage. but it does not count. That was one weird end of the half! into the arms of the Saints. to Matt Bryant this season. the touchdown to Michael Thomas! His fourth on the season. Can they get it to Jones down here? Ending in New Orleans intercepting. Brought down by Adrian Claymore. 344 to go, trying to keep control. a gain of 35 yards. a hold on the Saints. What an interesting call that was! there on the foul, 4th down and one. stop them on one more down. That was a really interesting call. I thought he might move them back. Orleans is in this game. have all those options on the table. onto that. I hope he's OK.
to the Reds and a heck of a catch. right here. You guys pulled it out. this weekend then back out. They all are, this time year. and were able to win. Jones towards the end of the game. tonight they would have been gone? be in the playoffs come January? wins or maybe they have a chance! answer would be drowned out! Orleans. What do you think? now, I think too hot for Carolina. over the next ten years? I will go with the Eagles. in Super Bowl 50 one. COMMENTATOR: -- brought to earth. The cause is never lost. 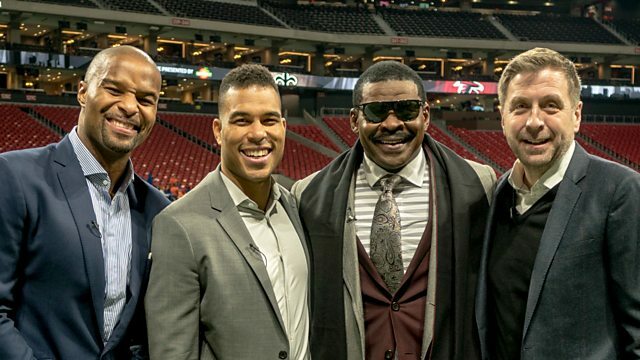 Mark Chapman, Osi Umenyiora and Jason Bell are on the road to watch Atlanta host the New Orleans Saints in a crucial game for both teams' play-off hopes. There is also a look around the Falcons' new $1.6m stadium, complete with its eye-catching retractable roof. The guys also have all the big NFL news and a look ahead to week 14's remaining fixtures in the run up to Super Bowl LII.